I'm so glad to know that this project is ongoing. You've done such a wonderful job, Bill, in preserving our past. Thanks, Rose! Great to have you back with us. Just for a change of pace, I have been working on Expo '86. I added a page of free downloads featuring a number of brochures, and will have more coming soon. I just added several newspaper articles from Expo '86 as well. I thought I had all of the various Groundbreaking and Dedication Booklets online, but I realized somehow I had missed the one for First National City Bank. I just scanned it and uploaded it. If anyone knows of any others I'm missing please let me know. Added Minnesota, Louisiana, Century Grill and Space Park pages to the 1964-65 New York World's Fair. Added additional photos to the Avis and Hollywood, U.S.A. pages from the 1964-65 New York World's Fair. Incredibly impressive Bill! I wish I had the time to make a 1939 website of color imagery and memories. I would be more than happy to help if any 1939/40 info is ever needed! Thanks, MB! I have a ton more to add - just never the time to do it. I have more 1964 stuff in the pipeline, then will probably start on Expo 85. I've been scanning a mountain of slides from that one, which was one of my favorite Fairs. I just bought several more lots of 1939 negatives and will get to those soon, I hope. All B&W though. Today's addition is another hour of background music originally heard at the 1965-65 NYWF. This hour is heavy on Sousa marches. If anyone can put names to the unidentified tracks please let me know. I have several more hours of music and will add more of them if there's enough interest. Added CD #11-13 to the Expo 67 section. Added Dedication Booklet for Pennsylvania Pavilion to the 1964-65 New York World's Fair section. Added additional stories to the 1964-65 New York World's Fair Magazines and Newspapers section. Recent additions are marked with NEW at the end of the entry. Added additional information to the First National City Bank page for the 1964-65 New York World's Fair section. Added three additional CDs to the 1964-65 New York World's Fair Photos on CD section. Added CD #2 to the Hemisfair '68 section. I have added a new section to WorldsFairPhotos.com - this one for Expo '85. This fair was held in Tsukuba, located near Tokyo. I had the pleasure of visiting Expo '85 while I was in Tokyo, and thoroughly enjoyed the experience. I'm just getting started and will be adding more items from my collection soon. Added additional photos to the 1984 New Orleans World's Fair Tour section. Added CD #4 and #5 to the 1939-40 New York World's Fair Photos on CD section. Added Vintage Disney CD #13 and #14 to the Disney theme parks section. Added CD #3 and #4 to the Expo 86 Photos on CD section. Added CD #4 and #5 to the 1984 New Orleans World's Fair Photos on CD section. 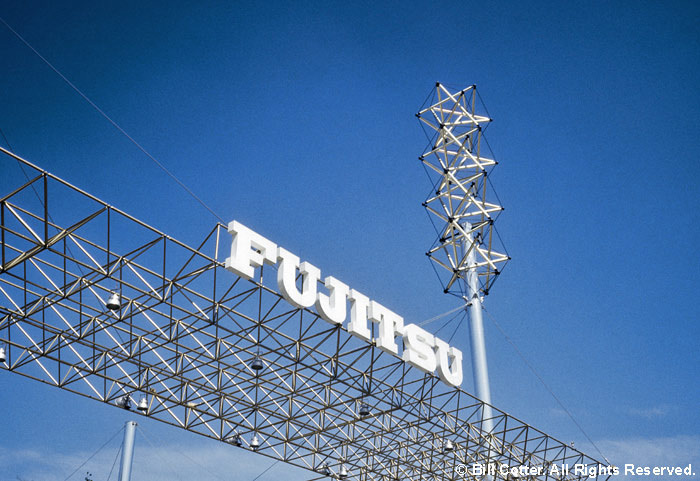 Fujitsu had a tensegrity sculpture. The Tower of Light had a few of these as well. I don't know much about this type of sculpture, so if you have any info please let us know. Tensegrities are structures first invented by Richard Buckminster Fuller. "The word 'tensegrity' is an invention: a contraction of 'tensional integrity.' Tensegrity describes a structural-relationship principle in which structural shape is guaranteed by the finitely closed, comprehensively continuous, tensional behaviors of the system and not by the discontinuous and exclusively local compressional member behaviors. Tensegrity provides the ability to yield increasingly without ultimately breaking or coming asunder." Added Hall of Science Dedication Ceremony, French Pavilion Dedication and Seven-up Ground Uniting booklets to the 1964-65 New York World's Fair Magazines and Newspapers section. Thanks Bill, especially for the 7-Up booklet. Also, thanks for identifying the CD number and photo number of all the photos - I forgot that you did that, and it really is nice to be able to find the originals on the CDs. Added page for General Electric at the 1964-65 NYWF. Added Norge brochure to the Festival of Gas page for the 1964-1965 New York World's Fair. Added Du Pont Magazine link to the Du Pont page for the 1964-1965 New York World's Fair. Added section for 1964-1965 New York World's Fair Corporation documents. The new section on Fair Corp documents contains an early booklet from 1960, with some very preliminary concepts for the Fair, and early logos before they settled on the Unisphere concept. Updated list of Pana-Vue slides for the 1964-1965 New York World's Fair, adding thumbnails of each slide. Updated list of ROLOC slides for the 1964-1965 New York World's Fair, including a copy of the original ROLOC catalog..
Added CD #6 to the 1984 New Orleans World's Fair section. You might mention there's another coming attraction- the original ROLOC slide catalog for Montreal's Expo 67. Both of these ROLOC catalogs were a PTU tag team effort- John Pender found them in his dad's collection, which in turn came from the legendary Peter Warner, and then I digitized them for Bill to put on his web site. I will have another Expo 67 update soon and will add it then - thanks for the advance plug and eminder! I keep forgetting to mention that there doesn't appear to be a working link to the 1964-1965 New York World's Fair Corporation documents on the index page... is this a coming attraction too?